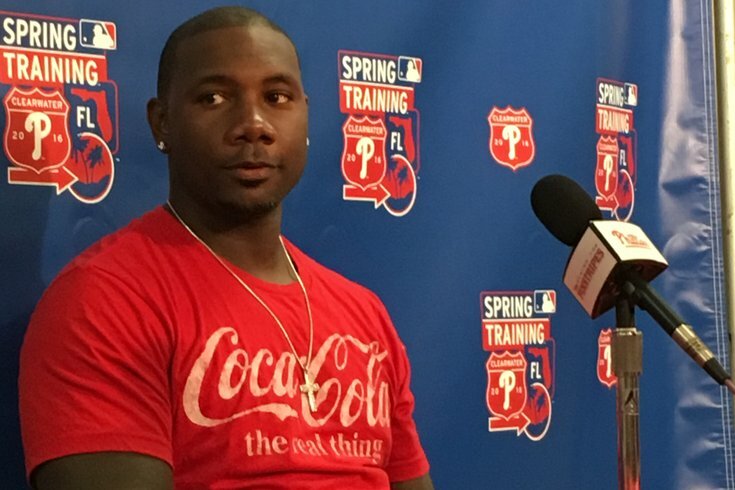 Ryan Howard meets the media for the first time since allegations of his PED use emerged in December. CLEARWATER, Fla. – When he first walked into the cafeteria/press conference room on Tuesday afternoon, following the team’s first full-squad workout of the 2016 season, it looked like a freshly-showered Ryan Howard, one of the last standing members of the glory years, was wearing a Phillies t-shirt. Instead, it was a Coca-Cola t-shirt, perhaps with a message for anyone who may have questions about the back of his baseball card or baseball-reference page after the bombshell performance-enhancing drug report from Al Jazeera America in December. In his first meeting with the Philadelphia media since Al Jazeera claimed he had used a hormone supplement that is ‘steroidal in nature’ called Delta 2, Howard was his normal, positive self. The legal proceedings prevented him from saying much about the allegations or the lawsuit he filed in response. But why did he think he was named in a report he called "garbage" earlier this month? Howard said he was “kind of shocked and surprised” when he was first made aware of the report in December. But after filing the lawsuit in January and reporting to Clearwater this week, Howard is leaving it in the hands of his legal team until his help is needed. Major League Baseball is also investigating the report, but Howard hasn’t been approached yet. “I haven’t spoken to anybody as of yet … I’m sure that’s probably going to take place,” Howard said. And that was how Howard handled his latest off-the-field nightmare on Wednesday. He said plenty exactly seven weeks earlier when he filed the 25-page defamation lawsuit, in which he “unequivocally and emphatically” denied Al Jazeera’s claims. Howard was one of several prominent athletes named in the report, along with Denver Broncos quarterback Peyton Manning and Washington Nationals infielder Ryan Zimmerman. For the second straight spring, Howard is looking forward to baseball as an escape from legal drama. A year ago, he reported to camp just a few short months after it became public knowledge that his family was suing him for a part of his career earnings. Throughout the 2015 season, Howard didn’t particularly look like someone who was enjoying himself on a daily basis. Howard’s baseball career, however, is also much closer to the end than the beginning and his Phillies career will be over at some point in the next seven months. Howard, 36, is entering the final season of a five-year, $125 million contract. He is still owed $35 million of that contract: $25 million in salary for the upcoming season and a $10 million buyout for the 2017 season. But that massive contract may no longer buy Howard regular playing time, which leads to the next bit of uneasiness the former MVP will have to deal with in 2016. First-year manager Pete Mackanin has said repeatedly in the last six weeks that Howard could sit more often against left-handed pitchers this year and work in a platoon with the right-handed hitting Darin Ruf. Howard and Mackanin had yet to have a sit-down meeting as of Tuesday afternoon, but the veteran first baseman was aware of the storyline that could find him on the bench more regularly in 2016. The record shows that Howard hasn’t necessarily been a productive hitter against left-handed pitchers throughout his career. He’s hit .219 with a .715 OPS against them in his 12-year career (while hitting .283 with a .940 OPS against right-handed pitching). In the last four seasons, since undergoing Achilles’ surgery, Howard has hit .184 against lefties with 22 home runs and 194 strikeouts. During that time, 44 percent of his at-bats against left-handed pitchers have ended in strikeouts. Still, Howard was downright defiant on the topic on Tuesday. At least Howard did some homework prior to the press conference: he is correct, his 10 home runs and 32 RBI were the most by a lefthanded hitter against lefty pitchers in the National League in 2014. He had better success against lefties (.230, .770) than against righties (.221, .658) that season. But whether you’re hitting .230 or .221 with a sub-.800 OPS, it’s not exactly the kind of production major league general managers are looking for out of their first basemen. In 2015, Howard hit .229 with a .720 OPS, with 23 home runs in 129 games and he batted an abysmal .130 with a .418 OPS in 107 plate appearances against left-handers. Then it doesn’t really matter anymore, at least to the Phillies (who won’t be contractually obligated to Howard after 2016) or to big league teams evaluating a 37-year-old free agent on more than one of his last five, mostly unimpressive seasons. The sad reality is Howard has become the poster boy of the Phillies fall from titans of the National League to rebuilding basement dwellers. He is a regular whipping boy for jaded fans (and, according to Howard, the media) and perhaps the only one still around with former general manager Ruben Amaro Jr. currently throwing batting practice in Red Sox camp.